Glue bottles similar to these are available on Amazon. I ordered a set of 4 to try out with Sky9pilot's formula for Duco/acetone. Will have to wait and see if the plastic used in the bottles/caps will stand up to the acetone. If they work they'll certainly be cheap enough at about $7 for a pack of 4. Tom, if I remember correctly you dilute Duco Cement 50/50 with Acetone. 1. is that the correct percentage? 2. What applying tool, syringe do you use and what supplier do you purchase from? 3. What are the applications for this cement are you using this adhesive? Well, I'm not Tom, but here's my answers. Yes, 50/50 is what I use a ratio. I use syringes from inkjet refill kits. I close the tip with a T-pin. I use it for pregluing, especially on endgrain, then use full strength for the actual assembly. I use Sig and Duco thinned with acetone. I have tried others but the bond was poor after they have cured. Since i build in my bedroom i use it in the warmer months when i can open the windows. I made a filter system using a small fan and filter so i can control the vapors and dust. The 527 dissolved in the acetone easily, more so than the Sigment did. However, after drying/curing, the bond was relatively weak. If only used for temporary tack gluing, the 527 might be OK, but probably not otherwise. I'm not familiar with Beacon 527 glue. I use Duco from Ace Hardware around $4 per tube. I usually thin about 50/50 glue/acetone. I then do the double glue step. Apply glue to both pieces of balsa to be glued let dry and then apple glue to one of the pieces and place together pin or clamp till dry. Usually works really well. Joint can be dissolved later with acetone if necessary. Just looked up the Beacon 527 and apparently it's toluene based. Chemistry not being my thing don't know how well this works with acetone?? ?...Google says toluene is dissolveable in acetone so that should work. I tried the Beacon 527 glue today, thinned to about a 2:1 mix with acetone. I tried a test piece first using two pieces of scrap balsa, then used it for framing the formers in a fuselage jig. Neither the test piece or the jig joints held very well at all. Next, I used an old tube of Sigment and thinned it about the same. Waiting now for the results. I'm trying to ween myself off the CYA, it affects my sinus. 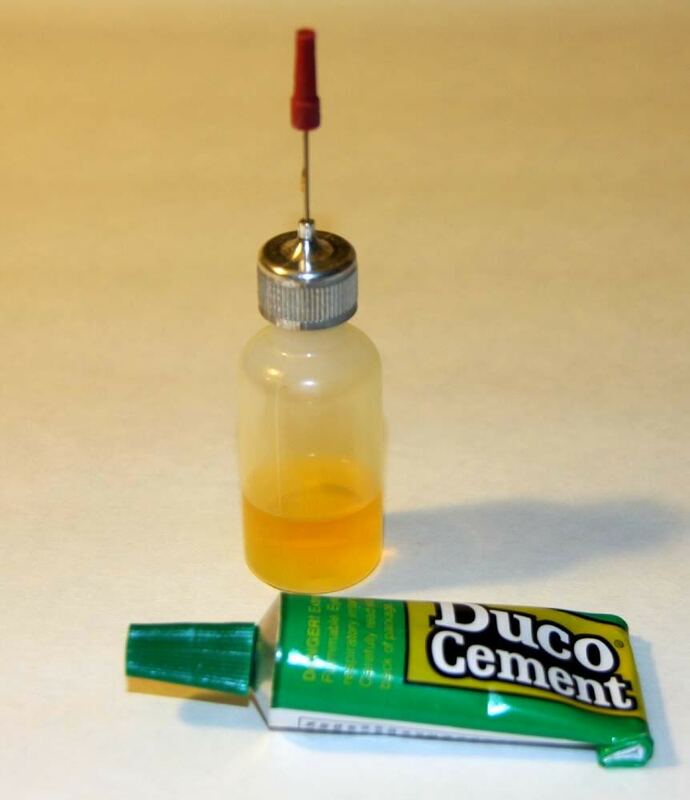 I've been using duco with the thin needle bottles I got from A2Z a while back. I think Shorty's is offering them now. I just eyeball the dilution to right around 50/50. A little thinner is alright too. I apply it on both surfaces that are going to be glued and let it set for a few seconds and then if one side has dried I add a bit more and stick them together. Pinning them together tightly. Good stuff! I use it for all the construction, makes me a better modeler because the joints need to be really good fitting. I get the Duco at ACE Hardware! About $3.50-$4.00 a tube. I get the acetone there as well or at Home Depot/Lowe's. What did l do this time!